Palomino Gold is the world’s first supplement formulated specifically for Palomino horses to correct low or inadequate intake of important nutrients on ‘white’ feed diets. Field trials with leading Palomino breeders and show exhibitors have shown that when supplemented daily as directed, it minimises the risk of dark ‘smutty’ patches in the coat. 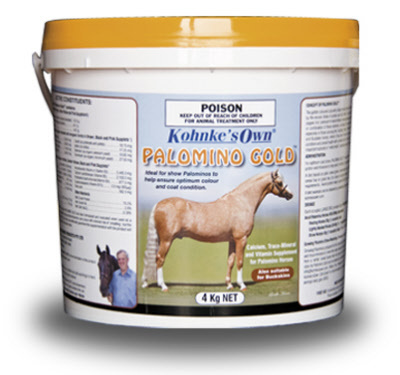 It helps ensure a healthy golden, dappled and uniform coat colour for show Palominos on a ‘white feed’ diet. A full range of minerals, trace-minerals and vitamins to make up shortfalls in cereal based ‘white feed’ diets – without providing excess of any nutrient which could result in ‘smutting’ and coat colour variation. Formulated from a blend of 5 separate cold-pressed Supplet® pellets to eliminate dust, sift-out, sludging in damp feeds and nutrient inter-actions. Low, economical dose rate -highly palatable - no sift-out or dust. Many successful Royal Show Supreme and Reserve Champion Palominos have been supplemented with Palomino Gold.